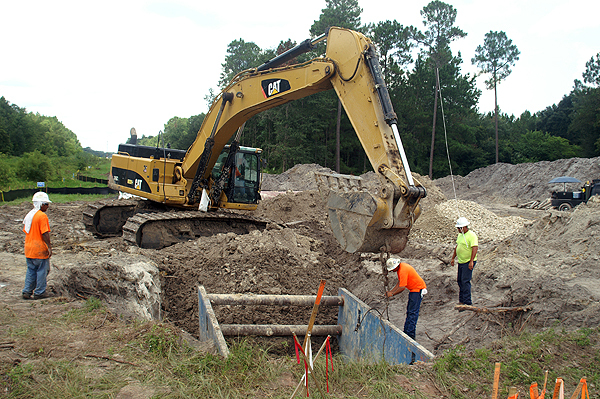 The excavator is the workhorse on pipelines projects. This excavator is being used to pull a trench box out of the trench. 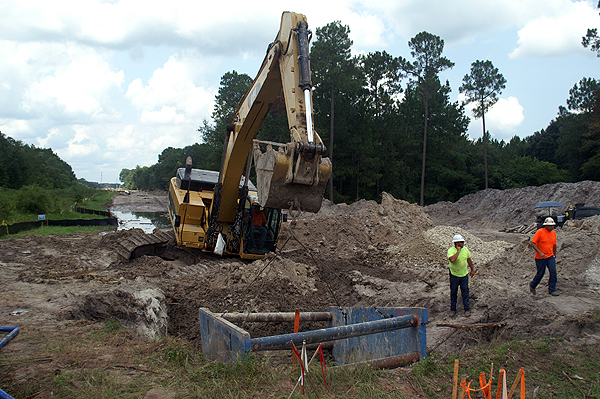 Normally this would be simple thing - just hook up the excavator and it smoothly lifts the trench box up. This time, however, the excavator is sitting on previously excavated soil. As the operator started lifting the arm of the excavator to remove the box, the excavator started sinking into the soft soil. The excavator had to be unhooked from the trench box, so it could level itself. Finally, the operator hooked the box with the excavator head and drug it out of the trench. The unstable spoil piles are another danger on the pipelines. Operators have been killed when their machine tips in unstable soil and the arm hit a power line. This entry was posted on Wednesday, June 20th, 2012 at 9:10 am. It is filed under Corporate, New Images and tagged with lift, pipeline, spoil, tilt, tip, trench box. excavator, unsafe. You can follow any responses to this entry through the RSS 2.0 feed.